New Delhi Sep 14 (IANS) Informative wildlife cartoons clubbed with play activities at the World Wildlife Fund (WWF) Delhi are part of an ongoing "Toony Tails" exhibition here that seeks to enthuse and educate children about the wonders of nature and wildlife. 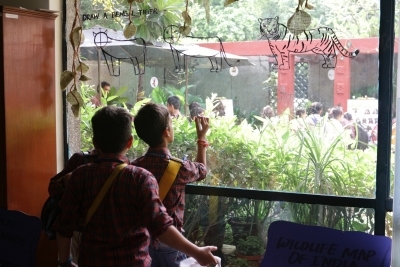 Blending fun and learning for school-goers the exhibition displays wildlife cartoons made by Rohan Chakravarty from Green Humour a platform that illustrates stories on wildlife environment and nature conservation. The exhibition curated and being hosted by WWF Delhi recreates a jungle atmosphere with animal calls mud tracks and tall plants. The idea was to make children learn through a humorous way so comics are put up about serious subjects like wildlife conservation WWF spokesperson Payal Narain told IANS. "It is a comical way of making them understand about sustainable lifestyles " she added. The guided exhibition begins with a walk through a cartoon gallery -- illustrating various animal species and the challenges they face -- and is replete with mud tracks and real and artificial plants. An interesting comic about the massive carbon footprint generated by Indian weddings is also linked to WWF s #GiveUp campaign -- an initiative to make people give up habits and practices that are environmentally detrimental Narain said. Visitors can also flip through WWF s new wildlife comic book "The Great Indian Nature Trail with Uncle Bikky" which is created in a "giant size with pop-up animals". "Toony Tails" also has fun activities like "The Uncle Bikky Nature Trail" -- a giant board game about India s rich natural heritage. The exhibition has a corner for moulding clay into animal excreta to highlight the role it plays in seed dispersal and providing habitat for insects. Another corner engages children in dance as they groove along a cartoon sloth bear Mahua Macarena. "Mahua flower is used for preparing liquor but sometimes animals consume it accidentally and they get intoxicated too " Narain said adding that children must know all aspects of wildlife. A doodle panel also lets the students draw tigers and other animals step by step. The walk ends with "Jungle Post" where students write letters on behalf of animals asking for help from their human friends. The walk and activities are facilitated by volunteers and have already been attended by schools like Akshay Pratishthan and DAV School Paschim Vihar. As per WWF the exhibition that launched informally earlier this month will run for next 3-4 months and will see participation from more school and college groups.